I went to two home improvement stores before I found out that only Home Depot (in my area) will cut plywood to your specifications! 🙂 (Going to the store was the hardest part for me, because I’m terribly intimidated by lumber yards–I feel like a fish out of water…maybe like most men might feel in a fabric store?) 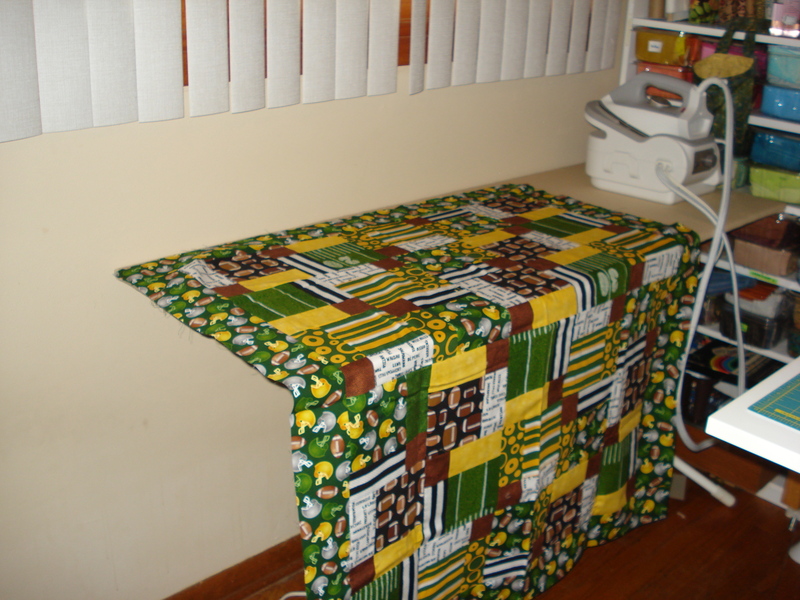 Because of my small sewing studio space, I had my board cut to 22″ x 54″ so it would fit nicely into the space I have (the real “Big Boards” are larger, about 60″ x 22″). So measure to see what your needs are. 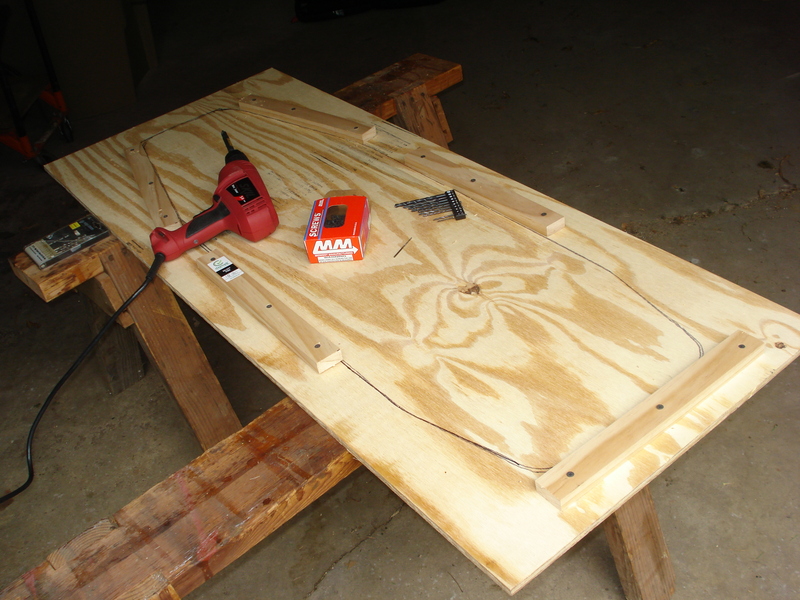 I found out that you have to pay for the entire plywood sheet (mine was sanded on one side and cost $20)–so I asked him to make a few extra cuts & I’ll use the remainder for shelving or some other project–and it will fit in the car!! He was so patient. 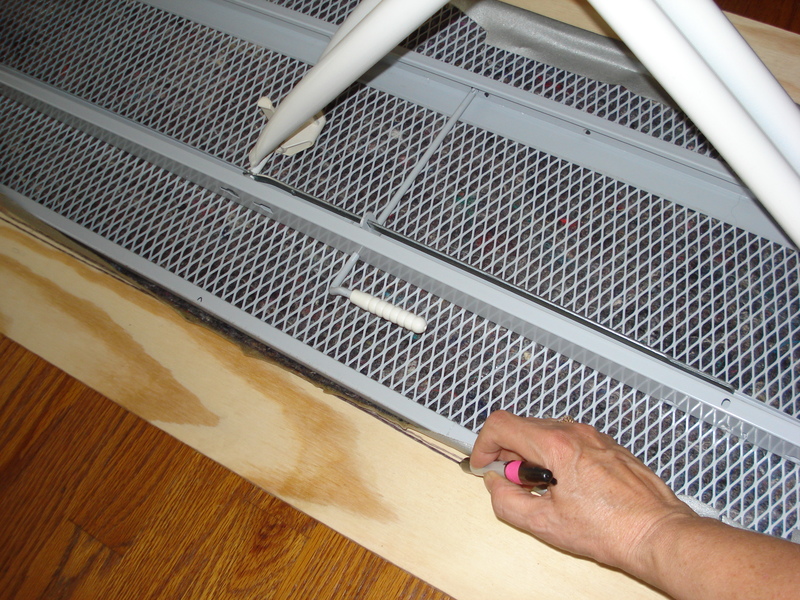 You’ll also need some type of sturdy, inexpensive planks that will be screwed into the plywood board to nest (snugly fit) over your existing ironing board. The directions I found on Pinterest called for 1-1/2 x 1/2″ wood planks, but Home Depot didn’t have any–so I used 1×2″ pine instead (6 foot section cost me $2.75). 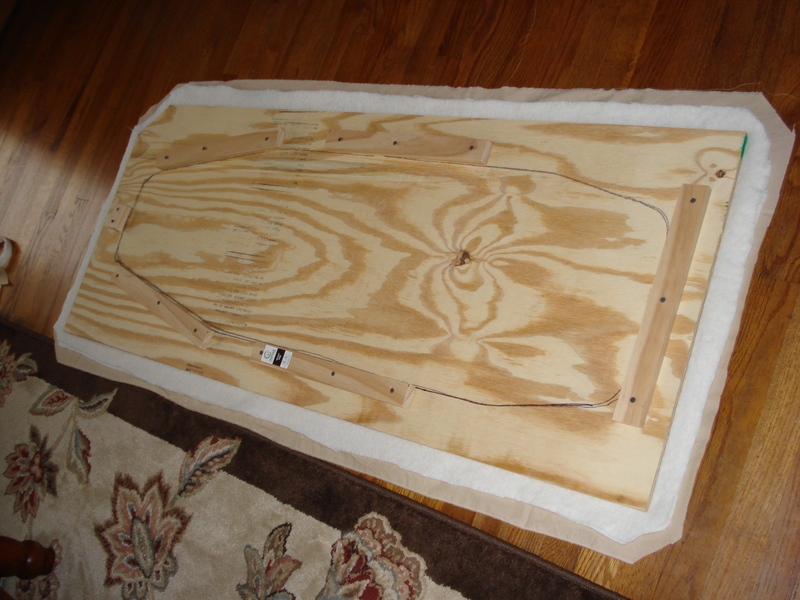 STEP 1: Lay your bare existing ironing board on top of the unsanded side (least pretty side) of your plywood. 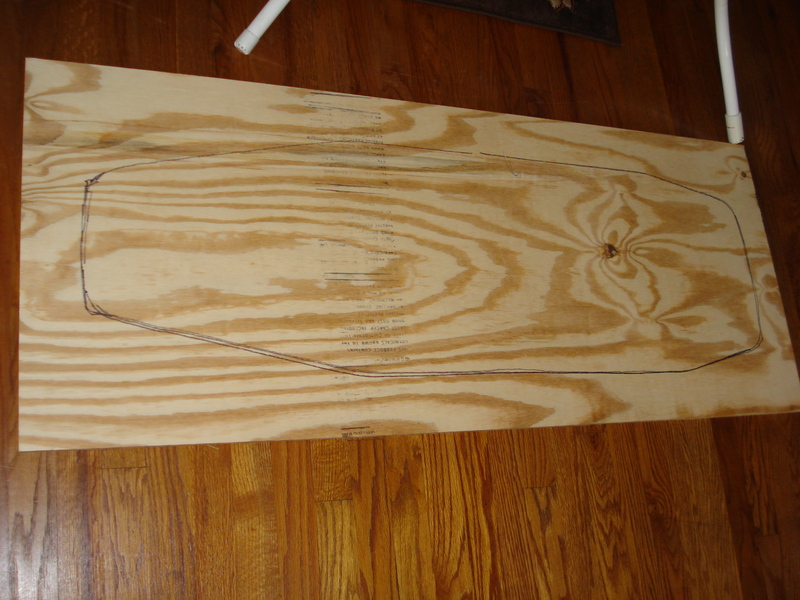 STEP 2: Using a magic marker–mark the outline of the ironing board on the plywood to use as your guide. 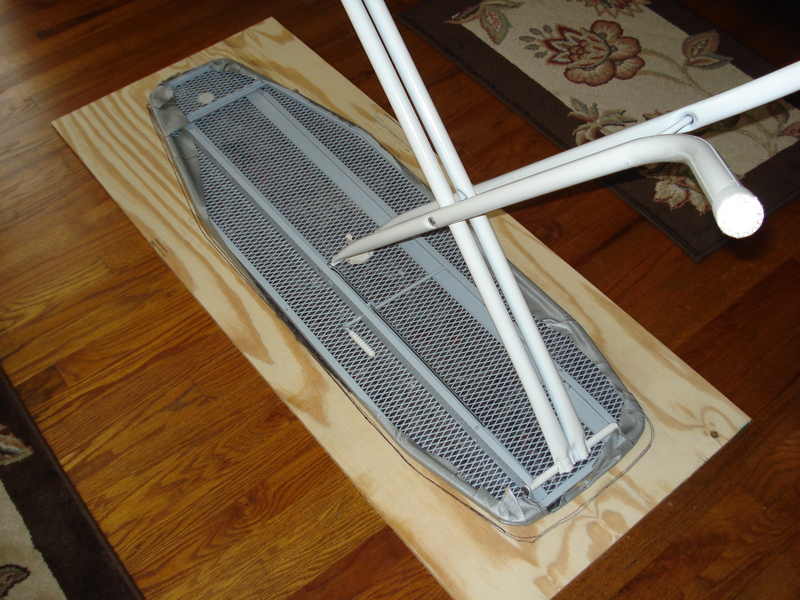 STEP 3: Position the 1×2’s (or whatever size planks you find) on the OUTSIDE of the drawn line, because your ironing board will snug right into the inside. You’ll see what I mean in a moment. 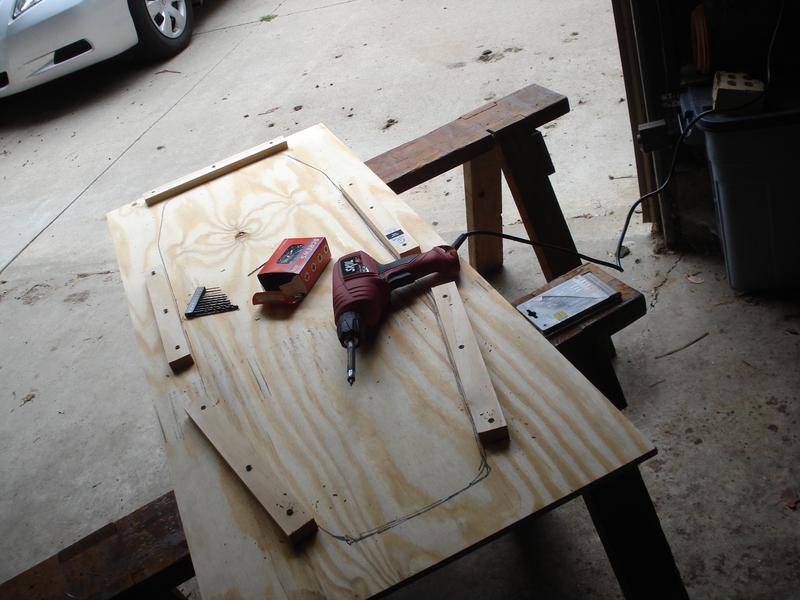 Pre-drill holes in the planking & board (don’t go all the way through to the top of the board! ), positioning the wood planks on either side, top and bottom where the ironing board will sit. Screw together (make sure screws are short enough that they don’t poke through the top). Now’s the time to double check and be sure it fits over the top of your ironing board so you can re-position if needed. 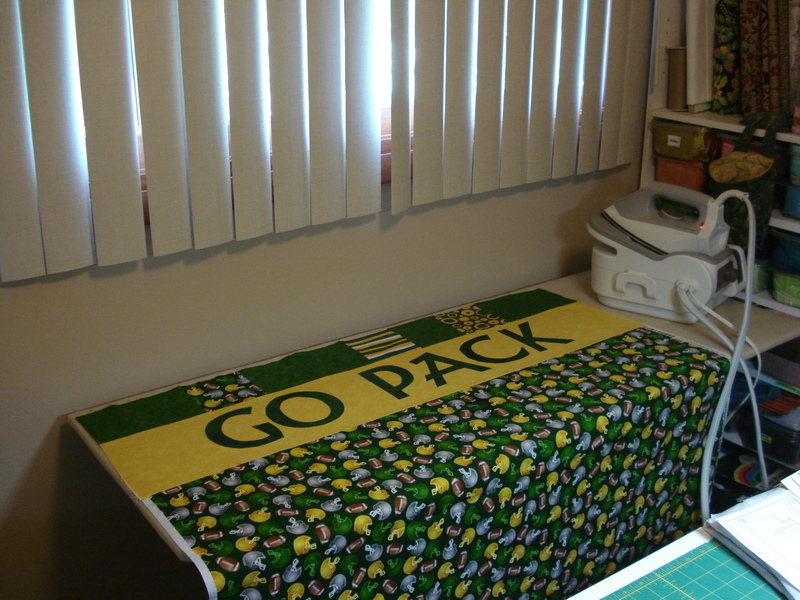 STEP 4: Cut a length of fabric a few inches longer and wider than the board and lay right-side down on the floor. I used some cotton muslin I had on hand—but wouldn’t a fun print look nice? Just be sure the fabric is cotton (so it won’t melt under the heat of the iron). Then put 2 layers of a cotton batting (low-loft) on top of the fabric. Then lay your plywood on top of that. 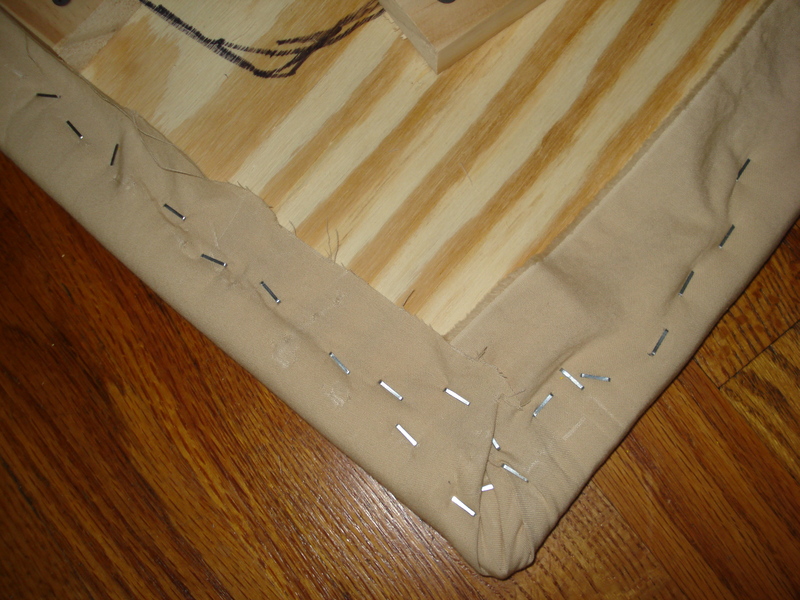 STEP 5: Using your staple gun, pull slightly on the fabric & batting to make it snug around the plywood (but don’t stretch the fabric too much) and staple it down. Start at the corners , then staple each of the ends opposite each other (top and bottom, side and side). Check the bottom (which will be the top) to be sure the fabric is nice and smooth with no wrinkles and continue stapling to secure nicely. You can trim any excess fabric & cover with duct tape if you like. 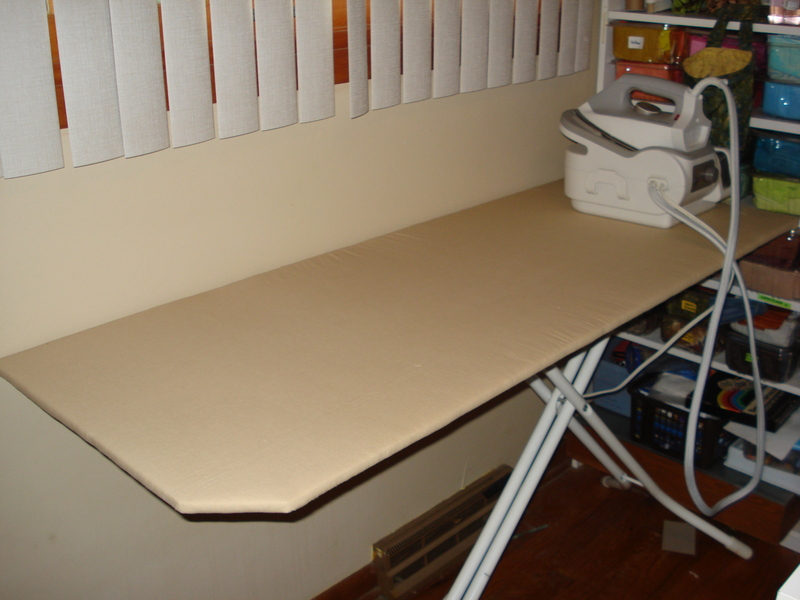 Just lift the plywood up and over and position it on top of your existing ironing board. It should fit perfectly! Made to order! Now I can iron an entire length (42″) of fabric off the bolt, or long strips or borders on my quilts! It will be wonderful for ironing binding… YEAH!!! And when the muslin top gets dirty or messy, all I have to do is take it off and staple on a new one. All for less than $25 (I didn’t count the fabric & batting, which I had on hand).